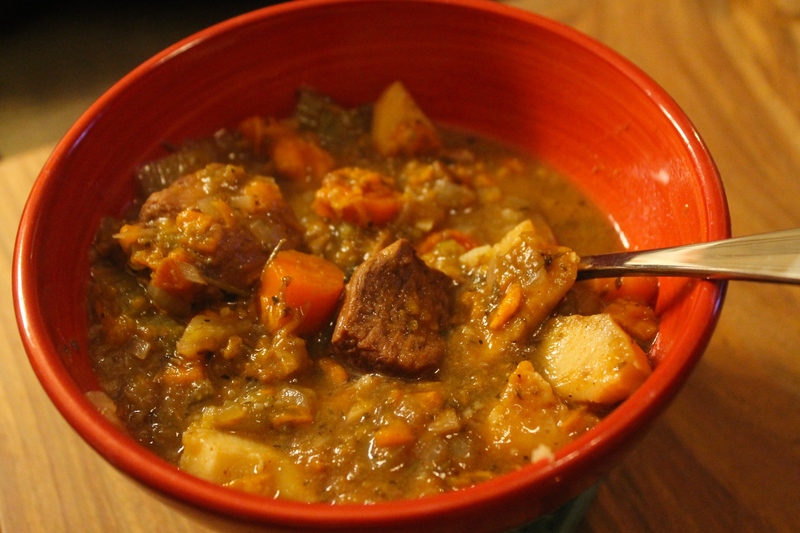 For all you Paleo peeps, this happens to be a Paleo beef stew I tweaked from this recipe. Instead of the traditional white potatoes in beef stew, I used two kinds of sweet potatoes – your standard orange flesh variety and Japanese sweet potatoes which have a darker, purplish skin and are actually white inside. Sweet potatoes have loads more nutritional value over their white potato cousins. They have tons of vitamin A, C and manganese and are also high in B vitamins, potassium and fiber. Japanese sweet potatoes have the same make up but their richly pigmented skins also make them considerably higher in antioxidants and anti-inflammatory properties. Scientists believe our digestive tracts benefit in particular because the compounds associated with these pigments may protect from heavy metals and free-radicals there. And that means a happier tummy. First, add the meat to the slow cooker, then add the liquid and all the vegetables, spices and seasonings. Set slow cooker to low and let cook for eight hours. About half way through, give it a stir to move the vegetables. If you want a thicker stew, do this when the timer dings: Ladle out most of the liquid into a small saucepan. Bring liquid to a boil, then transfer a small amount to a small bowl and slowly whisk in arrowroot until it’s completely absorbed. Pour the mixture back into the boiling liquid in the pot and remove from heat while you whisk continuously. If you want it even thicker, add some water to your small bowl and sprinkle in more arrowroot powder, whisk well, then add that to your liquid. Once at desired consistency, pour the thickened liquid back into the slow cooker and stir to mix well. Ooo this looks awesome and easy! Love me a good slow cooker recipe!